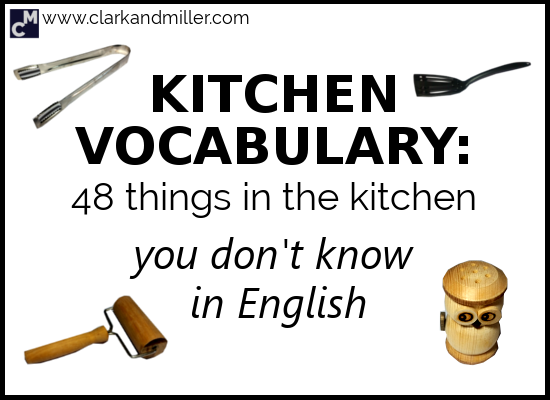 Today, you’re going to learn 48 common kitchen objects in English. For more general household vocabulary, click here. The small things can be the biggest problems. You can use your English at work with your foreign workmates. You feel confident when you’re travelling — because you can express yourself in English. You can read and watch stuff online with less and less stress every day. You can even explain the storyline of Total Recall. Seriously — what was that film about? And you realise you don’t know what on earth this is in English. And you don’t know that, either. And then you realise you don’t know half the kitchen vocabulary in English. It’s a common problem, so I went through my kitchen and took photos of 48 everyday kitchen objects that you probably don’t know. Probably. This kitchen item always makes me want to eat soup. This is sometimes called a potato masher, but I think most people would just call it a masher. I mean, what if you want to mash something other than a potato? It’s a spoon. Made of wood. We all know what this is, right? Or do you need to rescue your phone from the toilet? Often known as a potato peeler, this guy takes the skin off potatoes, carrots, beetroots, kiwi fruits … the list is endless. Is it just me, or does peeling a potato kind of feel like you’re shaving it? Small spoons with precise measurements written on them so you can do super-detailed cooking! Larger cups with precise measurements on them so you can do detailed cooking — with larger portions! It may not surprise you to learn that I’m a massive fan of tea. But not tea in tea bags (most of the time). But in order to avoid getting a mouthful of wet, slimy tea leaves, I use this! Have you ever tried to live without a colander? I didn’t have one for a few months, and I was surprised how many dishes need a colander. This is one of the most fun parts of doing things in the kitchen — chopping things with a massive knife! It’s the part of cooking that makes you really feel like you’re doing stuff! OK. This is one of those weird little things that can confuse even first-language English speakers. Technically, the one on the left is a butter knife. But no one says that. Especially the vegans. So we just say a knife, or maybe a normal knife. The other one is a tomato knife or just a sharp knife. I really like good knives. We bought some awesome ones from an Asian shop last time we were in Australia (where we picked up some interesting Australian phrases). They cut through a potato as if it were butter. They’re sharper than a Samurai sword. And I want them to stay sharp! Edit: It turns out “knife sharpener” is not the technical term (though it’s commonly used). Sharpening steel and honing steel are some of the technically correct terms. Thanks to Zumbruk for pointing this out. OK. Of course you know what a spoon is. But make sure you know the difference between a tablespoon (on the left) and a teaspoon (on the right). A can opener opens cans. Some of these are quite logical, yeah? Here’s something strange that I noticed when I went back to the UK recently. Most wine bottles don’t use corks anymore — just metal screw tops like you get with non-wine bottles. I don’t know why. Corks are nice! OK. There are two parts to this device. The curly thing with a sharp end that we use to open wine bottles (if there’s a cork, of course)? That’s a corkscrew or bottle opener. The other part that opens beer bottles? That’s just a bottle opener. You can also say cap opener — if you like American English. I know, I know. My garlic crusher looks weird and is a bit different from typical garlic crushers. But it still does its job! And what is its job? Surprisingly … a garlic crusher crushes your garlic for you! Just like you crush your enemies! The picture’s doing my work for me here. “But goggles don’t belong in the kitchen!” I can hear you say. Actually, I’m surprised by how few people have goggles in the kitchen. Here’s why I have goggles in my kitchen. It’s a nightmare to cut onions, right? They make you cry, and they make your eyes hurt. Why go through the pain of it all whenever you want a nice pasta dish? Just put on the goggles. Actually, like my garlic crusher, my oven glove doesn’t look like everyone else’s. We use oven gloves to take hot stuff out of the oven without having to visit the hospital. Again. It’s that stuff you use to make sure your cakes don’t stick to the baking tray. Again — my rolling pin looks a little different from most. Particularly useful when you’re making pizza. This isn’t the first thing you buy when you’ve moved into a new house, but it’s pretty useful. When you’ve made some awesome cookies, or a massive carrot cake, or those strange potato things that don’t quite look right, it’s good to put them on the cooling rack so they can cool down. This is the stuff we use to clean almost everything — the oven, the bathroom walls, the surfaces (see below). It’s a cleaner. For all purposes. So it’s called all-purpose cleaner. Washing-up liquid is for plates, knives, bowls, etc. So you’re doing the washing up, and you don’t want to get wet. Of course, they’re also useful when you’re cleaning, particularly with nasty, toxic chemical products. Bin bags are bags for your bin. You put rubbish (or trash or garbage) in them. We use it to do the washing up with. OK. It might not be immediately obvious what this is. You know when you cook something on the cooker, and you end up making a massive mess, with bits of tomato, soup and beans sticking to the cooker surface? You could try and scrub it off with the brush (see above). Or just get a scraper and scrape it off. What’s a cloth? Well — it’s just a piece of material. It can be weak and simple, or it can be strong and sturdy (like my one in the picture). We usually use it to “wipe” something with — the table, the cooker, your kids’ faces after they’ve attempted to eat that soup. Another incredibly useful kitchen thing. Especially when you’ve got messy kids. It’s mostly used to dry the other things on this list. I checked this one out online and it actually has loads of different words. It’s also known as: cling film, plastic wrap, food wrap, cling wrap and monstercat. OK. Not monstercat. But the others are real. I know this picture is not the best one on the list. Have you ever tried to take a picture of aluminium foil? OK. This one is quite simple but also a bit complicated. On the right in the picture, there’s a mug. Mugs are basically those ceramic things with a handle that you put tea, coffee, hot wine or herbal tea in. A cup is anything you can drink from that isn’t made of glass. So that means a mug is a type of cup. Some people would put “glass” inside the “cup” circle. I don’t. It’s something we usually put our tea or coffee on. We rarely use it to put sauce on. But for some reason, it’s called a saucer. Shouldn’t it be called a “tea-er” or a “coffee-er”? This is similar to a frying pan but deeper (and usually has a lid). Jars are one of the most useful inventions ever. Like all the good inventions, they’re incredibly simple. But we use them all the time! A jug is something we use to store and pour liquids. This is where your pepper goes! Yeah, I know — it looks like an owl. So this is where you put the salt. Have you noticed that some restaurants don’t have a clear system for their salt shakers/pepperpots? They sometimes put salt in the one with a single hole — or sometimes pepper in the one with a single hole. You can never be sure which one you’re going to get. But don’t keep looking at my awesome, slightly out-of-control hair. Look at what I’m wearing! That’s an apron. It stops your clothes getting stuff on them. Little pieces of cloth, plastic or wood that you put your plate on when you’re eating. Good question. I guess they sort of help stop the table getting dirty? I never really thought about it. I just use them. In some countries, it’s probably not a good idea to drink the tap water. So you’ll want to buy your water in bottles. The best way to get the water from the heavy bottle to your glass? You guessed it! Use a pump! OK. So you’ve had a meal, and you’ve got leftover food. So what do you do? You put the food in these containers, put them in the freezer and then forget about them … for a year. This looks like a picture of nothing, doesn’t it? Well, actually it’s a picture of the surface. That part of the kitchen that you do most of the preparation on. Or the part of the kitchen that’s completely covered in onion skin, plastic bags and dirty knives by the time you’ve finished cooking. Great for cutting avocados, mushrooms, strawberries and bananas. And eggs — if you like that sort of thing. Thanks to Krissie for this one and also for the next one. Balloon whisks have a more rounded end; French whisks are longer and narrower. To me though, they’ll always just be … whisks. Coffee pots come in all different shapes and sizes. Thanks to Maria for suggesting this. There we are — 48 (plus three!) things in the kitchen that you probably didn’t know the English word for. I bet I’ve missed something. Let me know in the comments, and I’ll try to add it to the list. Did you find this useful? Do you know any people (or rabbits) that might also benefit from this? Then BE AWESOME AND SHARE! Spread the knowledge! Hi Gabriel! What an awesome post! Loved it! Your sense of humor is catchy and your playful presentation of the 48 items memorable!!! An excellent job! An egg slicer is a good one not in the list! 🙂 A balloon whisk for beating eggs? 🙂 What’s up with me and the eggs?! Not sure, but they are rolling around in my head right now :). He he he. Awesome job indeed! Thanks for sharing! But yeah — great suggestions. We’ll probably add some more in time and definitely the egg slicer and the whisk will be there! Hi! If you were in a Greek kitchen you’d see one more thing, a “briki” (pronounced ‘breekee). It looks like a really small saucepan which can hold up to two cups of water. We use it to make Greek coffee. I love your articles, keep up the good work! Actually this specific one’s Greek, but I think these guys exist across most of the Mediterranean. I think you can find them in Morocco, Libya, Algeria, Tunisia, Egypt all the way around through Jordan, Israel, Palestine, Syria, Lebanon, Turkey and Greece. Possibly even in the Balkans, too? Can anyone confirm this? Thanks for pointing it out. I actually wasn’t sure that Israel used these coffee pots and omitted it from the list (which also misses out Greece, Albania and Spain — which I wasn’t sure about either). Just to make this clear – this is NOT an ideological omission. Editing my comment to add Israel now. It’s very common in Middle East. 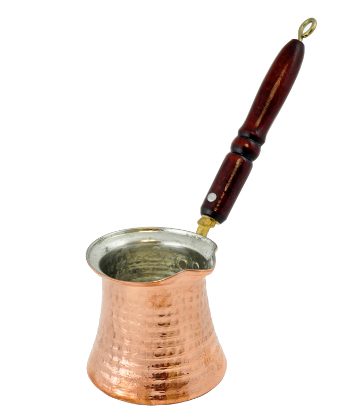 Turks have learned the coffee from Arabians and they called ‘kahva’. Turks have begun to say ‘kahve’. However, making coffee has changed in time. As a matter of fact the time was Ottoman Empire’s time. And we can understand why this objects is seen in so many regions. I think an acculturation has taken place about it. And in Turkey, we say ‘cezve’ for it. It’s definitely an interesting topic. The fact that this interesting coffee pot can be found all over the areas where the Ottomans were certainly suggests something. Perhaps the Ottomans introduced it? Or perhaps they discovered it from the Arabs and helped spread it across the Middle East? I’m no expert, but it’s a really beautiful piece of kitchen-ware nonetheless. What you called a spatula, we call an Egg slide – used for sliding eggs out of the frying pan or electric fry pan onto your plate. glasses for drinking out of, some call tumblers. What we call a dish cloth is the cloth the dishes are washed using, and it’s used to wipe down work surfaces and the table after a meal. Here is Aus we have four main kinds of spoon; tablespoon is the largest (used in cooking), dessert spoon used for eating the sweets course, a round soup spoon for eating soup, and a teaspoon for taking sugar from the sugar bowl and stirring tea or coffee. What you call a knife sharpener we call a sharpening or honing steel. Some people use a knife sharpener that consists of a slot into which you press and run the knife through, grinding both sides of the knife on the coarse metal at the sides. We have a sharpening stone we use, followed by using the sharpening/honing steel. Thanks Lori — these are great! At some point in the future, we’re going to beef up the post with all the different usages. These are super-valuable! And yeah — I remember those “grinding sides” knife-sharpeners. We had one when I was a kid. Really difficult to describe, but you did it perfectly! You should start a blog! I really love your post. It´s wonderful. Gabriel, I have a doubt: a “balloon whisk” is similar to the traditional whisker we use for whisking eggs? I saw the expression on an internet cooking site. Thank you so much, Gabriel. So balloon whisks have a more rounded end. The “knife sharpener” is properly called a “steel” or a “butcher’s steel”. A “can opener” is a “tin opener” in the UK. Only the Italians are still using corks. That’s a “washing-up brush”, not just a “brush” (a brush is for sweeping with, e.g., “dustpan & brush”). The “cloth” is a “dish-cloth”, and throw it away; they are festering pits of corruption. Nice one — thanks Zumbruk. We’ve been trying to be as comprehensive as possible while still using common terms (as opposed to technical terms that no one uses). So, I’m interested in the use of “steel.” I’ve never heard it, but that doesn’t mean it’s not used in some parts of the English-speaking world. Can I ask exactly where you’re from? Are you, by any chance, a chef? We’re totally going to add your suggestions in. I learned a lot of these words in French living abroad with a French flatmate! My French boyfriend sometimes gets upset that he doesn’t know this kind of practical stuff when we’re at my parents’ house in the UK and we’re putting the dishes away. But honestly, if you’re not planning to live in an English-speaking country, it doesn’t matter too much. You can always point, say “pass me the thingy” or describe the item! Haha! Yeah, “thingy” is really useful, too. Whenever I had this problem in Turkey (basically, all the time), I’d either guess what the word was (Turkish is like German in the sense you can use descriptive terms for objects and that’s probably what the object is actually called), or go for “the thing that you peel fruit with…” approach. It can be really frustrating, though. I feel your boyfriend’s pain! HI. Thank you for this useful vocabulary. I am definitely going to use it with my students very soon. There is an overabundance of terms which makes things a little more difficult to learn, but we will make it!